Creating dainty, realistic peony blossoms of all sizes is now easily achieved with the beautifully illustrated Small Sweet Peony Cling Stamp Set. When paired with the coordinating die, these delicate petal and foliage pieces come together perfectly to form exquisitely layered, dimensional blossoms! 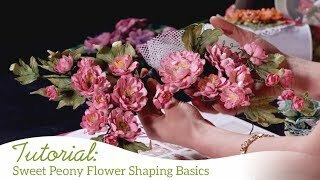 Vary the petal sizes and configurations to create the ideal sized peony bloom for every project! Light, airy and divinely graceful, the peony flower is a splendid blossom choice for all of your spring and summer paper craft creations! This cling stamp set is part of the Sweet Peony Collection and pairs with the Small Sweet Peony Die.This stamp and die combination has been created for use with the Floral Basics Shaping Mold as well as the Deluxe Flower Shaping Kit.